iOS 4.0.1 Update Is OUT! Why? Cos after upgrading to iOS 4, many of her applications especially games screwed up. Remember about God Finger? It was one of her favorite iPhone games. After the upgrade, the game always hangs or quits itself. That is after she upgraded the God Finger game to be iOS 4 compatible. So, I googled iOS 4.0.1. It turns out that the update is to fix the formula to determine how many bars of signal strength to display. None of my business though. We are not using iPhone 4. 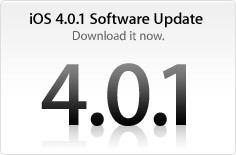 After checking a few review of the iOS 4.0.1, those who upgraded to iOS 4.0.1, some of them met with problems with their connections and some of them are fine with the upgrade. My verdict? Not going to upgrade yet. Still waiting for a better update. If you are confident, then you can upgrade it for the sake of upgrading cos the update doesn’t make any big difference. Just a conclusion of my experience of upgrades regardless of iOS or anything, do not upgrade too quickly or you might regret it and remember to backup and do research. Next story My 1st Redang Island, Malaysia Trip!! !